As we get closer to winter, I've been taking stock of my herbal medicine cabinet and deciding what to restock. There are certain items, I like to keep in stock most of the time and none of it terribly exotic or mysterious. Generally speaking my herbal supplies are homegrown or foraged very easily in my local area (I do supplement with purchased herbs when necessary). I do believe that we all have different health needs and because of that our herbal medicine choices are also different and individual. That being said, however, it does seem like there are a few standards that are easy for beginners to start embracing while also being great staples for the more experienced herbal healer. 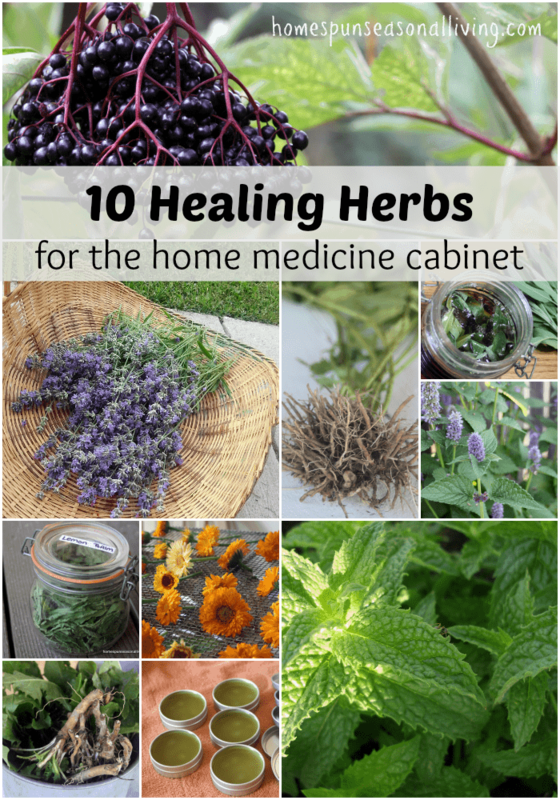 If you need a few ideas on what to keep on hand, here are my favorite 10 healing herbs to keep stocked in the home medicine cabinet. I dry this mostly and use it for a calming tea that also helps relieve congestion. It's also quite nice in a bath. I don't keep tons of it around but Anise Hyssop always has a space in my medicine cabinet. I keep a jar of calendula-infused oil for making healing salves, lotions, and more. It has many soothing and anti-bacterial properties, making it great for many topical applications. I also keep a jar of dried petals handy for tea. Calendula & plantain tea is supposed to be a treatment for leaky gut. I always have a jar of dandelion flower infused olive oil on hand. It's a great treatment for arthritic joints and we rub it on whenever we feel inflammation taking root. I also use the infused oil in healing salves. Dandelion root is also good at helping flush the liver and helping us ease the ill-effects of eating too much at those holiday buffets. I make large batches of medicinal syrup but I also make some tincture. Elderberry is my go-to cold & flu fighter. The minute I start to feel a little something coming on, I start taking some syrup or tincture and keep it up until my immune system feels back to normal. This amazing scented herb is something I keep around for culinary and medicinal purposes. I most often use lavender in healing salves and body butters to help soothe and nourish dry skin. This is a favorite of mine, simply because I really enjoy the flavor in my herbal tea and infused in honey. Lemon balm tea is also generally considered to have a calming effect on the nerves. Having lemon balm in the medicine cabinet means I can also use it in my lip balm to help treat cold sores. I dry a lot of mint. I also infuse a bunch of it honey. For the most part, it's simply that I enjoy mint, but the tummy soothing qualities of mint can not be denied. Any bit of upset stomach and I reach for the mint tea. I also find that mint helps me relax at the end of the stressful day. As I said with the calendula, I combine dried plantain with calendula for a tea that is supposed to help with leaky gut. I also like having it around infused in oil so that I can make healing salves for general purposes around our homestead. A tincture is supposed to help with various ailments as well, though I haven't needed it as of yet, having it dried in my cabinet, however; means I can experiment with a tincture when I'm ready. I keep a bunch of dried sage around for culinary uses, there's no denying how very tasty it can be in certain dishes. Beyond that, however; I keep a giant jar of sage infused honey to mix with tea or just hot water when a sore throat shows up. It's a great way to soothe that scratchiness in my experience. I haven't needed it yet, but I also understand that sage is a great treatment for hot flashes. This amazing, albeit slightly stinky, root is our go-to insomnia remedy. A tincture of valerian root helps us fall asleep with ease and calms any kind of mental anxiety with which we might be struggling. We all need different herbs and remedies in our home herbal arsenals – we all have different bodies and issues and items needing attention. This isn't meant to be an exhaustive list, but rather just a sampling of what I keep and how I use it to hopefully inspire and encourage. We don't need everything in our herbal medicine chests, we just need what works for us and sometimes it's a matter of keeping it simple. Which herbs are most important to your herbal medicine chest? Thanks for sharing. Do you have instructions on how to make essential oils from assume of these plants or should I just buy them? I don’t have instructions for making them and I know you need some kind of distillation process / equipment to make it happen. I just buy essential oils when I need them, that being said I tend to use the whole herb most often. I use Turmeric most often, for colds and the like. But I’m thinking I’ll experience with some of these. Thank you! Turmeric does have amazing healing properties but I’m allergic to it. What kind of mint do you prefer? I have mint, peppermint, spearmint and chocolate mint. I don’t find the regular mint dries well for me. I end up with this nasty chlorophyll tasting green mulch. Have not tried the others yet. Thanks for your article. How do you get the calendula? I have to bring calendula products from my native country in South America. I have never seen a calendula plant in the United States. It is a plant with wonderful properties. Thanks! Calendula is also called “Pot Marigold”, and it is native to the USA. It is an annual, but reseeds freely such that soon an area is filled. I got my first calendula plant from Wayside Gardens and have since infused the flower heads in EVO in the sunshine for about a month. I am trying to learn all about herb and herbal medicines. Can you tell me what you do with your dried mint? I have tons of mint but don’t know what to do with it. Mostly mint is used for indigestion or upset stomachs. I find mint tea helps me unwind at the end of busy, stressful days too. Infuse a bunch of dried mint leaves in a small basin and soak tired, achy feet. I make a tea from dried, loose chickweed to help improve circulation in my ankles. However, it tastes like wet hay! So, I always add a teaspoon of Holy Basil tea leaves and/or Peppermint. Mint helps to nicely flavor other not so yummy medicinal herb teas. How do you infuse these herbs into oil? And what kind of oil? Also, When you dry these herbs are you just cutting them and leaving them on the counter till they are crunchy? Is there a process to drying herbs that I should know about? Thanks SO much for your article!!! Mountain Rose Herbs has a great post on how to infuse herbs in oil here: http://mountainroseblog.com/making-herbal-infused-oils/ – I follow that general method and I use olive and grapeseed oil most frequently. I don’t have an herb drier, but I’ve used both hanging bunches of herbs around my kitchen and my ovens. The small one operates with a timer and turns off on its own. Take care with standard ovens. I warm up the ovens a bit and then turn them off. Then I lay the herb leaves on paper toweling over foil that I fold up on the corners to make a little tray. These I slide into my warm (not hot) ovens to dry for several days. If your oven is too hot, the leaves will blacken and the herb is spoiled, so take care. This, I find, is very helpful during humid times. I didn’t know that anise hyssop relieved congestion, but that totally makes sense. I need to make sure I plant some at this new place. The pollinators absolutely love it! The pollinators really do love it. In my growing zone, it can be tough to keep it as a perennial but I’ve found that growing it near the house keeps Anise Hyssop thriving unless we get a really long cold snap. Hi Kathie, My Grandmother told me when I was very young that cayenne was a magical plant, and to always have it on hand. She used it a lot in many ways. Do you use it, and can it be added to these recipes? Love your work, and thank you for the info. Cayenne is amazing for a multitude of things. I’m a bit of a wimp when it comes to the heat, however. It’s a great thing to have around and I do use it now and then but not tons. I add cayenne and cinnamon to my Mexican “cocoa” mix. I use the quotes because I sneak some other healthy things in there that no one notices as well. The other thing that I use cayenne for is a pain/muscle salve along with turmeric. I infuse my chosen oil with both and then make a salve or rub as usual. Fair warning: the research studies on both turmeric and cayenne used as a topical treatment show that it basically has to be used non-stop for best results. So while it isn’t great for those occasional pains that sports enthusiasts get, it is great for those that get constant pain from things like arthritis or constant pain from repetitive tasks. Also, depending on your infusion/salve mix, turmeric can stain things if it’s in high concentrations, so I tend to be cautious and warn others if I share it. I use it on my shoulders and wrists because if I’m not on the computer, I am lugging things in my backpack. It smells much better than BenGay or TigerBalm and if I ever start getting plagued by the arthritis that runs in my family, I will start using it those places too. My mom, already uses it for her hands and she is one of those people that are really hard to turn onto herbal medicine, so it must work for her. Since I’ve already gone on and on, I’ll add more detail. I call my recipe St. Margaret’s Dragon. In part because of the Saint’s story and in memory of my grandmother and her arthritis, Margaret. I passed it onto my Hispanic former MIL and she gets a huge kick out of the name, being Catholic too, and it helps her gnarled hands. She was a fountain of herbal information from her cultural knowledge that I miss talking to as often as I used to. Luckily, we all still keep in touch. I’m curious about what you refer to as “leaky gut.” Is that heartburn? Diarrhea? It’s not a phrase I’ve heard before. My favorite herb for winter is the versatile mullein, although I’m also very fond of callendula and arnica. I’ve been experimenting with pine needle salves recently; opening a jar of the salve is like smelling the outdoors. Leaky gut is a medical condition that is often associated with autoimmune disorders. It’s mostly used by alternative health practitioners, it isn’t recognized by main stream medicine at this point. Yay for pine needle salves! Mullein is an amazing herb that I need to use more often. Love your choice of herbs. Just to clarify. Leaky gut is also known as intestinal permeability. At this point, the science behind it is rather clear and it is an established fact in people with Celiac disease. The discovery was by first made by Dr. Alessio Fasano, who identified a protein called zonulin that is largely responsible for causing this phenomenon. I’m another mullein fan. Not only is it a great medicinal, but it grows in any climate and is a great way to utilize those far less than perfect areas where nothing else will grow. It thrives in those “wasteland” areas. Plantain is, also, not particular about where you plant it and is another amazing medicinal. If you are growing mullein and want to try growing plantain, make sure not to plant them in the same area. They work great together medicinally, but neither will grow well if planted together. Mullein grows wild here and I used to just wildcraft it. I decided to harvest some seed and scatter it on the other side of my irrigation ditch. It does great and I don’t have to go so far to harvest, now. Plantain doesn’t grow wild in my area surprisingly, at least I haven’t run across any. I bought some seed and scattered that on the other side of my property and it grows well. In the past, there have been questions about whether leaky gut syndrome is a “real” condition or not. Recent research has confirmed the reality of leaky gut, showing that, indeed, physical gaps between the cells that line your intestinal barrier can develop, which allow undigested food particles into your blood stream. A gut protein called zonulin regulates the opening and closing of these holes in the cell wall of your intestine. No one mentioned ginger? Raw or in tea; hot water, lemon/honey if you want. I work in an area of immigrants, bronchitis & colds were a twice a month occurance until we started ingesting as much as we want! For those of us who eat it daily the colds have been nonexistent! For myself, no cold or bronchitis since August! Leaky gut is also common with Autism. We treated our daughter, by changing her diet, as though she had/has leaky gut. We noticed a very big difference in her actions. Leaky gut is definite real. what is your view on anise hyssop (Agastache foeniculum) versus true hyssop (Hyssopus officinalis). I am just starting my journey with herbal remedies, and i have read some articles claiming that anise hyssop does not have the medicinal properties that true hyssop does and that only true hyssop should be used. And other articles such as yours use anise hyssop. It’s like anything, everyone had their opinion. That being said both have amazing flavor and medicinal properties. I’m in the middle of an herbalist course and they actually use both – use what feels right to you. I keep everything for about a year and store them in glass jars in a dark cabinet.